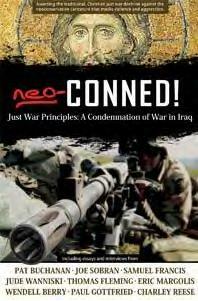 Stephen Heiner: Book Review: Neo-CONNED! Why: Because it is morally incumbent upon every Catholic, especially Catholic Americans and Britons, to investigate whether we are engaged in a just war. Summary in a sentence: The most compelling collection of essays explaining Catholic war just theory and its specific application in Iraq available. I've put off this review for months. It's rather like the priest who has not had the chance to say his Brievary all day. At around 6pm, the task seems daunting. So too, overwhelmed by the magnificence and articulation of this volume (and we're not even talking about the 700 page plus sequel) I've been at a loss of how to "review" this collection. What I've decided to do is to take each of the parts and discuss important ideas from the various essays included. I hope that I do the ideas some justice, but to get a better idea of the whole picture, read and buy this book yourselves. The content and breadth of the book requires that you bring your intellectual A-game, at the very least. IHS Press does a tremendous good work by its efforts to disseminate the riches of the social teachings of the Catholic Church. Of course, that wisdom is not limited to economics. It is essential to fidelity to our common patrimony within Western civilization, our citizenship in the United States, and our duty to God and His Church to be informed about the issues of our day. Regardless of one's position on the so-called "war on terrorism" and its prosecution in Afghanistan, Iraq, and the streets of America, this collection of essays published by IHS's imprint, Light in the Darkness Publications, should offer anyone in pursuit of intellectual honesty an opportunity to weigh the arguments so seldom heard in the media, from politicians, and at the coffee counter. This part begins with an interview with Jude Wanniski, an economist under Ronald Reagan and a former associate editor of the Wall Street Journal, that is devastating. The first question and the beginning of its answer sets the tone for the entire piece. Q: The invasion of Iraq in 2003 by the United States and Britain was based primarily on the claim that Saddam Hussein possessed weapons of mass destruction, theoretically being manufactured to threaten other countries. How much truth was there in that assertion? A: None at all. The U.S. Armed Forces only considers nuclear weapons to be weapons of mass destruction. 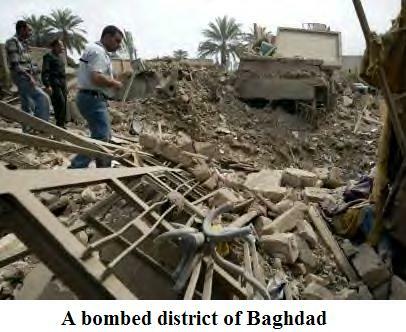 Iraq had neither nuclear weapons nor chemical or biological weapons. The only thing it may have possessed were some of the ingredients necessary to develop chemical or biological weapons (p. 3). Wanniski then sets upon roasting chestnut after chestnut that NeoCons have brought forth as "alternate reasons for war." For example, if there are no weapons of mass destruction, well, Saddam was a threat to the region, etc. He discusses how the US self-sabotaged the UN inspectors and the inspection process after the First Gulf War, as well as the strange policy of sanctions that punished only the people of Iraq, not Saddam. He states: "The fact is that the propaganda surrounding our effort to starve more than 20 million Iraqis into submission to cover up the botched job of our political establishment in that sorry land has been among the most effective of the twentieth century" (p. 6). Indeed, Saddam was once our ally against what we supposed was a larger threat, the Iranians. "The United States supported Saddam in his war with the Islamic fundamentalists because it suited our purposes" (p. 16). But by 1998, "Saddam essentially believed...that all that was happening was that Anglo-American demands were forever increasing, and Iraq was getting precisely nothing in return. No government with any self-respect would accept such a situation. Saddam's government also said that it would not cooperate with the inspections because many of the inspectors were American spies. It is important to note that they refused cooperation because of their doubts about the inspection team's composition and aims" (p. 15). "Iraq came out of the war (First Gulf) burdened with $40 billion of debts, excluding the aid given by Arab states, some of whom consider that too to be a debt although they knew - and you knew too - that without Iraq they would not have had these sums and the future of the region would have been entirely different...We began to face the policy of the drop in price of oil. We then saw the United States, which always talks about democracy, but which has no time for the other point of view...When planned and deliberate policy forces the price of oil down without good commercial reasons, then that means another war against Iraq. Because military war kills people by bleeding them, and economic war kills their humanity by depriving them of their chance to have a good standard of living. As you know, we gave rivers of blood...but we did not lose our humanity. 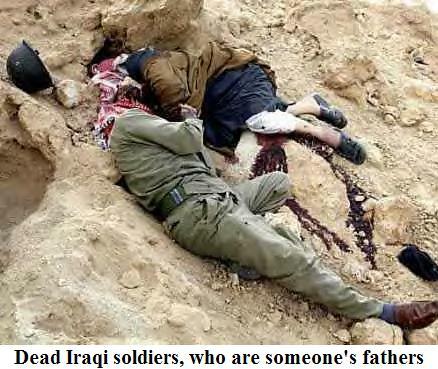 Iraqis have a right to live proudly. We do not accept that anyone can inure Iraqi pride or the Iraqi right to have high standards of living...because without pride life would have no value" (p. 18-19). The famous story of the gassing of Iraqi kurds is even rendered dubious as Wanniski asks rhetorically after discussing the background behind the story: "Is it really credible that the man who would have authorized the use of gas to kill civilian Kurds would have been aided by Kurdish leaders?" (p. 27) Indeed, our own Defense Intelligence Agency circulated a classified report that postulated that it was Iranian gas that killed the Kurds, not Iraqi (p. 26). A little further on, in a separate piece, Dr. Marc Bossuyt brings us back to the question of sanctions, namely, what we did to the Iraqis prior to this second war. He comments: "It should be emphasized that much of the controversy around the number of deaths is only serving to obfuscate the fact that any deaths at all caused by the sanctions regime indicate grave breaches of humanitarian law and are unnacceptable" (p.90, emphasis in original). As for the Iraqi children? UNICEF statistics noted that "13 percent of all Iraqi children were dead before their 5th birthday. For the most part, they died as a direct or indirect result of contaminated water" (p. 105). Good luck getting that statistic on Hannity and Colmes anytime soon. "Economic sanctions are rapidly becoming one of the major tools of international governance of the post-Cold War era" (p. 109) yet "They are often discussed as though they were a mild sort of punishment, not an act of aggression of the kind that has actual human costs," (p 110) like it actually does. "Those who are least able to survive the ensuing hunger, illness, and cold are the very young, the elderly, and those who are sick or injured. Thus the direct consequences of siege (here presented as economic "siege" upon a population -s.) is that harm is done to those who are least able to present the least military threat, who have the least input into policy or military decisions, and who are most vulnerable to hunger, cold, and illness" (p. 114). Dr. Bossuyt closes the article by talking about this weapon of "mass distraction," discussing the humanitarian emergencies, smuggling, kickbacks, surcharges, and profiteering that went on the US-sponsored UN-led sanctions program. Perhaps these sentences sum up his (and what should be our) sentiments best: "If the goals of sanctions are the enforcement of humanitarian standards or compliance with legal and ethical norms, then extensive and predictable harm to civilians cannot even be justified by reference to survival or military advantage. Insofar as this is the case, sanctions are simply a device of cruelty garbed in self-righteousness" (p. 121). This essay is followed by Patrick J. Buchanan's now classic Whose War? which first appeared in the March 24, 2003 The American Conservative. Blockbuster would be an understatement for this at-the-time timely indictment of purposes, intention, and persons involved in the path to war. While the last sentence of this essay does it no justice, perhaps it gives some insight into the ground Mr. Buchanan covers: "Though we have repeatedly said that we admire much of what this President has done, he must at some point jettison the neoconservatives' agenda of endless wars on the Islamic world that serve only the interests of a country other than the one he was elected (twice) to preserve and protect" (p. 147). This part of the book goes a long way in attacking the idea of "unpatriotic" as a necessary label to be placed on those against the war. In the preface to Charley Reese's Legal Nonsense article, the editors comment: "Michael Novak, for instance, tried to tell the Vatican in February 2003 that the U.S. was justified in attacking Iraq because of what 'a spark of contact' between Saddam and terrorists 'could' have accomplished, implying that America's right to make war arose from the possibility that Saddam could have done something to the U.S. His 'just-war doctrine' includes the idea that America must ensure that no nation possesses the capacity to inflict harm on it, and make preemptive war in any direction it thinks will best 'protect the lives and rights' of its people. Happily, Novak's fantasy isn't part of any just-war doctrine permitted to Catholics, for a true title to make war comes only from an ongoing or imminent, grave and actual violation of a nation's rights - not from a merely potential one, regardless of whether the potential might be a clandestine, unannounced (terrorist-style) attack. Nor does it particularly matter, from a moral point of view, that submitting to the moral law in foreign affairs carries perhaps more risk than ignoring it and obliterating anyone who possesses the capacity to do us harm" (p. 166, emphasis in original). In an article called Riding the Red Horse: War and the Prospects of Success, Dr. Thomas Fleming, editor of Chronicles: A Magazine of American Culture, poignantly postulates: "Empire - or rather, the concept of benevolent global hegemony - is one of the gifts of Mesopotamia, but it is a poisoned chalice. The story of the Tower of Babel is the Bible's commentary on the Babylonians' attempt to build a multi-ethnic state, and the ruins of Nineveh and Babylon and Persepolis should warn the most rugged imperialist against the danger of walking in the footsteps of Sargon and Sennacherib" (p. 179). In the same article, in a line seemed classically designed to answer the "creating democracy in the Middle East" canard told to us all, he states: "The history of the Middle East gives little encouragement to those who imagine that an oil-rich Switzerland can be established among the ruins of Nineveh and Babylon" (p. 174). And speaking of oil, Wendell Berry, in an article entitled The Failure of War makes a statement that seems to slip our mind everytime we pull up to the pump: "At present, in the face of declining finite sources of fossil fuel energies we have virtually no energy policy, either for conservation or for the development of safe and clean alternative sources" (p. 195). Thus, the Catholic "just-war theory" is the acknowledgement of the right of nations to self-defense against an unjust aggression. This is simply an application of the natural law - legitimate defense is a natural right. Just as it is obvious that every man has the right to preserve his own existence, so too does the state have the natural right to defend itself against a real, immediate and grave threat to its very existence and essential good (p. 212). Fr. Iscara does not choose his words lightly. Real. Immediate. Grave. Also in this section, Dr. Thomas Ryba's article Epistemic Inadequacy, Catholic Just-War Criteria, and the War in Iraq, a decidedly focused and scholarly piece, attempts (successfully) to "show that formulations of just-war theory that concentrate on the criterion of probable just cause - and particularly the Bush administrations's theory of the justification of the recent war in Iraq (insofar as it may be called a theory in any important sense) - attempt to dodge the issue of moral certainty in favor of the certainty of the preponderance of justice (a probabilistic and material criterion). What I will attempt to show is that, certainty about the probability of justice liberalizes the grounds for war, and that such a liberalization is problematic" (p. 223, emphasis in original). In another essay, a writer uses a quote of Paul W. Schroeder, writing in The American Conservative: "The more one thinks about it, the more implausible it becomes to claim that the United States, a superpower with an historically unprecedented position of unchallenged military superiority, is threatened by an impoverished, ruined, insecure state halfway 'round the world" (p. 250). Dr. Cavanaugh's piece, To Whom Should We Go? Legitimate Authority and Just Wars starts by making this important point: "Decisions about if and when we Catholics should kill should be left to the President. This line of thinking is dangerously wrong" (p. 269, emphasis mine). He continues: "Moral judgment in the Christian tradition is a matter not just of information, but of being formed in the virtues proper to a disciple of Christ" (p. 272). An extremely fascinating part of this essay is Dr. Cavanaugh's discussion of David Urquhart and the work leading up to the First Vatican Council in developing Church policy on modern war and warfare. Among other things, "Urquhart urged the Vatican to establish a 'diplomatic college' qualified to rule on whether or not a particular war met just-war criteria. If a war were declared unjust, then absolution would be refused for all killing in that war, and communicant soldiers would be expected to refuse orders" (p. 281). Pius IX, of happy memory, was very supportive of the project and perhaps Urquhart's proposal, which made it onto the agenda of Vatican I with no real opposition, would have passed. Ironically, the very Council which might have put together a methodology to oppose modern war was broken up an unjust war itself, which culminated in the theft of the Papal States. Dr. Cavanaugh continues: "...the individual Catholic has a grave obligation to inform his or her conscience as to the morality of any given act of war, and not to cede such judgments ot the state" (p. 284). "Pope John Paul II's opinion should count more than Donald Rumsfeld's or Bill O'Reilly's. At the very least, the Catholic should not simply abdicate moral judgment in this matter to leaders of a secular nation-state" (p. 288, again, emphasis mine). Please be aware that I am not speaking to you as a theologian or as a private Christian voicing his opinion, nor by any means am I speaking to you as a political partisan. I am speaking to you solely as your bishop with the authority and responsibility I, though a sinner, have been given as a successor to the Apostles on your behalf...Humanly speaking, I would much prefer to keep silent...But what kind of shepherd would I be if I, seeing the approacth of the wolf, ran away from the sheep?...Therefore I, by the grace of God and the favor of the Apostolic See, bishop of the Eparchy of St. George in Canton, must declare to you, my people, for the sake of your salvation as well as my own, that any direct participation and support of this war against the people of Iraq is objectively grave evil, a matter of mortal sin. Beyond a reasonable doubt this war is morally incompatible with the Person and Way of Jesus Christ. With moral certainty I say to you it does not meet even the minimal standards of the Catholic just-war theory (p. 293). In a separate article, the Bishop laments: "The Catholic youth of this country, I am convinced, need moral and political protection from the power and shrewdness of old men and women, who, because of a lifetime spent amid the machinations of nation-state politics and economics, have become desensitized to the reality of what it means to send a young boy or girl to kill and to die on behalf of their elaborate agendas" (p. 298). In his article Peace Is Still Possible: The Unity of the Church in the Face of the Iraq War, Deacon Keith Fournier reiterates a timeless truth in examining these matters: "We Catholics must always start with Catholic teaching and then inform our thought, rather than using that teaching as a cloak for political, economic, or social theories that don't correspond to its correct conceptions of the human person, solidarity, authentic human freedom, economic and social justice, and matters of war and peace" (p. 307). Dr. Rao's piece, entitled Decadent, Belligerent, and Incorrigible talks about the problem of how the American political reality, beholden to no one and to no morality, has made a wreck of the modern nation-state construct. Two quotes deserve our attention. "...one of the most dangerously criminal forces operating internationally in union with America: the State of Israel" (p. 325). This is the first time Israel has come up in this review, but it has come up many times in the book up to this point. It is a major part of our "Iraq policy" that Americans overlook. That is, that much of our blood and treasure is spent on defending people who comprise an incredible minority of Americans, but who wield an unparalleled lobbying power. "...the 'free society' infected with the Western malady is always one in which the strongest wills of the unrestrainedly passionate predominate" (p. 325). Indeed, this is part of the problem with those who cannot place criticisms of America by Americans in its proper context. If we lament America's problems, it is at the very least because America is capable of greatness, true greatness of the type only Christ can bestow, if it were only to acknowledge its Creator. Until that time, our "free society" is our religion. And indeed, we may say to ourselves "evil, be now my good." Paul Likoudis' The Morality of Weapons Systems was the most disturbing chapter of this book. It discusses the widespread use of "depleted uranium," a type of material used in many projectiles in Iraq, which, due to its turning into a dust form because of its use in warfare, is causing unbelievable medical harm to both Iraqis and Americans. The article starts: "The photographs are gruesome beyond description. They are newborn Iraqi babies, born without heads and limbs, sometimes they are blood red, sometimes black, sometimes covered in an unknown white film, sometimes with gaping holes in their torsos that expose their internal organs" (p. 345). The article ends: "DU (depleted uranium -s.) dust is everywhere. A minimum of 500 or 600 tons now litter Afghanistan, and several times that amount are spread across Iraq. In terms of global atmospheric pollution, we've already released the equivalent of 400,000 Nagasaki bombs...The numbers are overwhelming, but the potential horrors only get worse. DU dust does more than wreak havoc on the immune systems of those who breathe or touch it; the substance also alters one's genetic code..." (p. 350). Speaking of wreaking havoc, the harm this has done to our soldiers has been dismissed over and over again, and despite testimony before Congress, our veterans who have been exposed to this deadly agent die a silent death, with no government assistance. Again, someone get that to Fox News for their "good news in Iraq report." Christians would recoil in horror and refuse to obey the State. But if the State were to say: 'Here Christian, put on this uniform, take this gun, go to Iraq, and kill someone else's father,' I am afraid that many Christians would reply, 'When does my plane leave?'" (p. 355). This echoes a quote that Dr. Peter Chojnowski uses in his article Is Conscientious Objection a Moral Option? "...They hold and practice the doctrine that the state, being an end in itself, can do no wrong; that the right to declare and carry on war comes implicitly from the fact of war itself; that it is not necessary to attempt to justify it by the ordinary maxims of morality - it is its own justification" (p. 371). Indeed, Dr. Chojnowski reminds us: "What we must remember here is that it is not only man who is directed towards a specific end. Institutions, along with all socio-political structures and actions, are also directed towards a specific end as determined by their unique place in the Divine Plan" (p. 367). In the late war, each State defended or pretended to defend some sacred ideal: Serbia defended herself against absorption by Austria; Russia and Montenegro defended the peoples of their stock; Austria her "Prestige" in the Balkans; Germany her fidelity to her "Nibelungen ideal (Nibelungetreue); England defended the rights of neutrals; Japan the Mongolian interest; France fought to free the annexed provinces from the oppressor; Italy to release her subjected Italian brethren; Armenia for the democratic ideal. Belgium alone fought in self-defence. What Turkey fought for is not apparent, but seemingly she was dragged unwillingly into the fray. These attempts to justify the war by proving it to be purely defensive are so far a move in the right direction in that they show, compared to previous occasions, an increased feeling of the moral responsibility which rests on all Governments in declaring war (p. 393). Ottaviani's and Amerio's voices, both from the grave, are haunting. Moreover, should the representatives of any people (or the people themselves) ever have conclusive indications that their rulers are on the point of undertaking a war in which nothing but blood and ruin will be the lot of the nation, they may and should take just measures to overthrow that regime (p. 424, emphasis in original). ...Circumstances can change the moral evaluation that one must make of war, and can render illicit things which were licit and good in the different circumstances of times past (p. 427). Talleyrand's maxim to the effect that states ought to do as much good as they can in peace and as little evil as they can in war, is overturned by modern war, which turns society into an engine of destruction (p. 431). I expect it will be some time before I give Neo-Conned Again! (the lengthy sequel) a similar treatment here, but do expect it sometime.